This luxury sports vehicle has many advantages in terms of performance, safety and interiors when compared to other cars in its range that we’ll look at shortly. The MDX stands for ‘Multi-Dimensional Luxury’, and is known for its versatility, comfort and luxury by many drivers that own it. 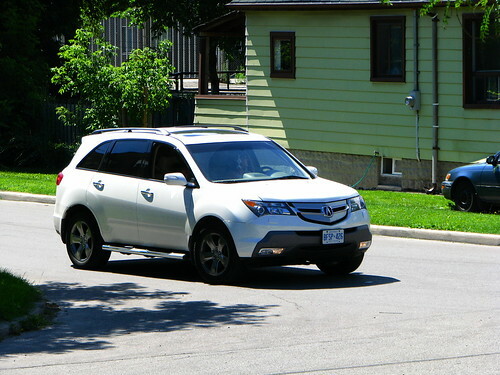 So, what exactly are you getting when you buy an Acura MDX? Let’s kick things off by looking at the features on the exterior. The vehicle comes equipped with a rearview camera which produces a display whenever the driver is reversing. This is accessible on the car’s rearview mirror, and is especially helpful when you’re backing out of parking spots, parallel parking or seeing objects that may not be visible via the rear view window. The other exterior feature that may prove to be priceless is the power tailgate, which can be controlled from a button on the driver’s side door. If there’s a power failure, the tailgate can be opened manually. Additionally, if there isn’t a lot of space between the tailgate and the exterior, it will reverse itself to gain some space for full opening or closing. Additional features include a Blind Spot Information System, which comes with the Advance Package. This is especially useful for safe lane changes. The Acura MDX breaks new ground by offering third row seats, meaning that this is the perfect SUV’s for big families that travel together. Additionally, the front seats have side bolsters that jut out, providing lateral support when the car approaches corners and give extra comfort for long journeys. The driver’s seat has a 10-way adjustable power seat and lumbar support which comes in handy for a driver that spends a lot of time behind the wheel. The 2-driver automatic memory system also remembers the driver and front passenger preferences when it comes to the steering wheel, side mirror positions and the seat position, taking intuitive control systems to a whole new level. The 3.7 liter engine is the largest of all of the Acura models, and delivers 300 horsepower and 270 pounds per feet of torque. The estimated mileage when it comes to fuel efficiency is 16 mpg for the city, and 21 mpg for the highway. An impressive power-to-weight ratio is achieved thanks to cylinder heads made of magnesium alloy. Lastly, the Drive-by-Wire ™ throttle system gives varied throttle sensitivity depending on the driving conditions, ensuring that you get the best performance whether you’re driving on rain-soaked or ice-covered roads. The Acura MDX comes with an array of entertainment options, some of which include a Rear Entertainment System, iPod or USB integration, Music Voice Commands (MVC®) and the iconic Acura/ELS Surround Sound System. The car’s seven passenger capacity, powerful engine, good crash test scores and affordable price are its main selling points, on top with the features we’ve examined above. The Acura MDX has a starting price of $43,030, with extra packages such as Technology, Entertainment and Advance packages bumping up the price. The Acura MDX is in a class of its own as being the ideal crossover SUV that is designed for large families in mind.